We have been struggling financially (like every other American family) these past few years. I have been looking around for ways to bring in an extra income without affecting my corporate job or my home responsibilities. A few months ago my hubby and I were at a Farmers Market. I came across so many booths with ladies and men selling home made goodies. My husband turned to me and tells me, "Dennyse, you are so talented and you can have your own booth selling all the goodies and sewing things you know how to make." This made my day! That same day I arrived home, got on the internet and researched everything I needed to do to get myself started to run a home business. I got my food handlers card, insurance (for business), and my business license all within 2 days. I started posting on Facebook of all the goodies I was selling and my business officially started. 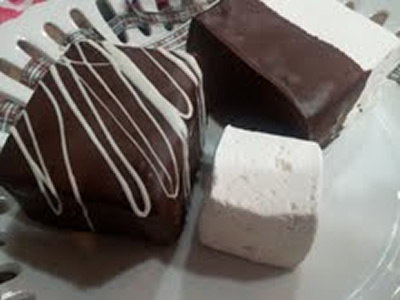 I make my own marshmallows and truffles. I temper my own chocolate (paid a Chocolatier to train me on this), and I make a few other chocolate covered goodies. 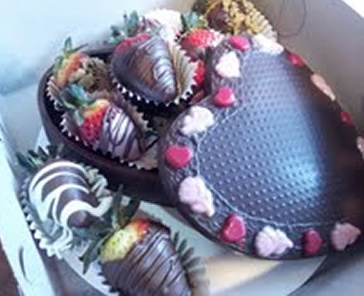 For Valentines Day I sold 20 of those chocolate heart boxes filled with 10 strawberries. I had 2 customers order the Heart Chocolate box and had me hide jewelry between the strawberries. I had fun doing this. 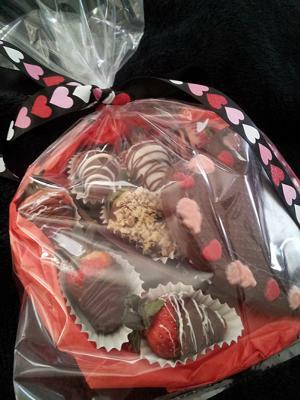 I also sold chocolate covered strawberries and truffles which I packaged nice and pretty. some profit. Mind you I didn't have anything... I was starting from scratch (all I had was tons of melting Chocolate I had purchased during Christmas for the goodies I make for my family and friends during the holidays). I had to buy molds, paper, baggies, ribbon, boxes, and everything I needed to make this a success and to package all my goodies so that my customers would want to order from me again. Like the saying goes, "We eat with our eyes first." I will tell you this... I made a profit of 45%...WOOT WOOT....I'm making money! I was going crazy because I didn't prepare myself like I should have, maybe because I wasn't expecting all the orders, especially the last minute ones. I made 16 of the chocolate heart boxes the day before Valentine's Day, with only one mold (crazy huh?). So, for Mothers Day I want to do the same since they were my biggest money maker, and I want to be prepared. I love this little business I started. I am happy that my husband encouraged me to do this, and that I am still able to be present in my home while helping bring home a little extra money. I still have a lot to learn about chocolate. I know how to eat it and make it in the moment I get orders, and I know there is alot more for me to learn. If you know of any book, videos or schools that I could benefit from, send it my way. I am eager to learn. Thanks so much, Dennyse, for showing us your gorgeous goodies and telling us the story behind how you got your own "home business" up and running. Hope you decide to add your goodies to our CCM Store so that our visitors can buy your creations online. Also, you can find some helpful tutorial videos on the Food Network website, Martha Stewart's website, etc. Again, that won't cost you anything more than internet time. Wishing you the best of success for business!